Timeless and classic, the Duofold is a pen of outstanding quality and performance - a rare and precious luxury. It is a pen for someone who is confident, classic, and conspicuous, with a clear-cut vision of the future. A decisive person with the utmost elegant taste. A person who commands attention. A pen to aspire to, its balance and elegant profile provide comfortable, effortless writing. Fountain pens come with a medium nib and are shipped with a bottle ink converter and one blue ink cartridge. Roller balls and ball pens are fitted with advanced ink system, medium point, black ink. Decorated with 23-karat gold-plated trim. Customization available on Duofold includes an engraved monogram on the crown, or die-struck emblem on the crown. Parker has developed premium packaging exclusively for the Duofold! 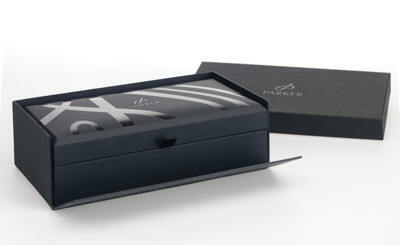 It features a sturdy outer box and a Duofold branded, inner gift box. This high-quality gift box is a permanent display case for your Duofold writing instruments. An inner removable tray conceals refills and the warranty & instruction booklet. Parker has developed premium packaging exclusively for the Duofold! It features a sturdy outer box and a Duofoldbranded, inner gift box. This high-quality gift box is a permanent display case for your Duofold writing instruments. An inner removable tray conceals refills and the warranty & instruction booklet. Two character, Three Line Roman font. The emblem stocking program provides for prepaid crown emblems and clip emblems for all products in the drop-down menu above to be held in inventory on the client's behalf. Releases from inventory can be quickly turned around. Emblems from inventory will be invoiced after they have been manufactured. Prepaid emblems are held for two years from date of last release and must be used within that period. Emblems with no activity beyond two years will be discarded. Same size nickel finish emblems and brass finish emblems can be combined to meet the minimum order of 50 emblems at no additional charge. Repeat orders can be converted from brass to nickel or nickel to brass at no additional charge if the 50 piece minimum order is met. *Add $1.50 per color, per emblem, for die-struck enamel color-filled emblems. Only available with purchase of a Parker Duofold, Sonnet, Frontier, or product. 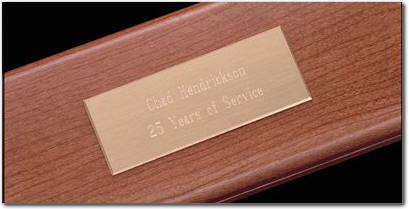 Standard position of logo engraving is centered on the lid. If a different position is required, please note on order.